On January 20, two St. Albans School robotics team traveled to Baltimore to test their skills against 30 other teams at the BMore Robotic-Have a Dream-VRC Regional Tournament at the Baltimore Robotics Center. STA teams, 343X and 343G, went undefeated in the qualifying matches enabling them to advance to the playoffs and finals. 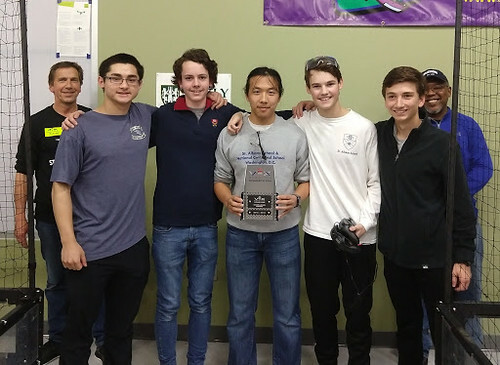 Team 343X won the Excellence Award, presented to the overall best robot, qualifying for the CREATE U.S. Open State/Regional Championship on April 5, in Council Bluffs, Iowa. Our teams also participated in the D.C. VRC Turning Point Tournament at Friendship Public Charter School on January 26, against 15 area teams. Team 343X went undefeated in the qualifying rounds moving on to the semi-finals. Team 343G advanced to the finals and beat out their competitors to become the VRC/VEXU Tournament Champions. Though this tournament was a nonqualifying tournament, it was a great victory against tough competitors. Please join us in wishing them good luck at the D.C. State Championship on Feburary 23. If they win this competition, they will qualify for the VEX World Championship in Louisville, Kentucky.